An artist’s illustration of the Martian meteor shower caused by Comet Siding Spring’s flyby of the planet on Oct. 19, 2014. The comet has passed Mars in this view and is shown heading back toward the outer solar system. 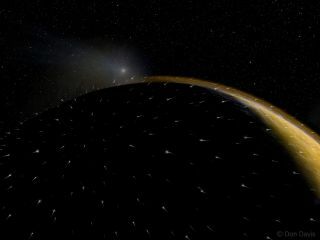 Mars’ atmosphere is exaggerated in this illustration to highlight the presence of a coherent group of meteors due to the comet’s debris stream. The annual Perseid meteor shower may be great, but it's got nothing on the brief sky show a comet gave Mars a few years back. Comet Siding Spring produced the most intense meteor shower in recorded history when the object flew by the Red Planet in October 2014, according to newly analyzed data collected at the time by NASA's Mars Atmosphere and Volatile Evolution (MAVEN) orbiter. For comparison, viewers with dark skies can usually count on seeing about 80 meteors per hour during the mid-August peak of the Perseid meteor shower, which is perhaps the most famous and reliably impressive of Earth's annual showers. The Siding Spring Martian shower, however, was a one-off event. The comet zoomed within 87,000 miles (140,000 kilometers) of the Red Planet's surface on Oct. 19, 2014, sending huge numbers of particles careening into the thin Martian atmosphere. "This is one of the most exciting planetary events that we'll see in our lifetime," Beatriz Sanchez-Cano, of the University of Leicester in England, said in a statement. "Mars was literally engulfed by the coma, the comet's outer atmosphere, for several hours." Sanchez-Cano also presented Siding Spring flyby results at EPSC 2017 today. Those results are based on observations by the European Space Agency's Mars Express orbiter, as well as NASA's MAVEN, Mars Odyssey orbiter and Curiosity rover. "In addition, the encounter happened at the peak of the Martian dust season," she added. "We need to understand the full context of the observations in order to separate out the real cometary effects on Mars." Comet Siding Spring, also known as C/2013 A1, was discovered in January 2013 by astronomer Robert McNaught at Australia's Siding Spring Observatory. The roughly 0.3-mile-wide (0.5 km) Siding Spring came to the inner solar system from the Oort Cloud, a distant realm that houses trillions of comets. Siding Spring won't pass our way again for millions of years.